I had already written this set of blog posts about the released “State of American Children” report when the news came out on Saturday that Michael Dunn avoided being found guilty of 1st degree murder in the killing of Jordan Davis. He was found guilty of three counts of attempted second-degree murder, and will almost certainly do serious time for that. But it still came across as a “hollow victory” (in the words of Tonyaa Weathersbee), and leaves many feeling a deep sense of grief as they make sense of what this means and represents. Though there is not a straight line between the murder of Jordan Davis and the reality of 1 in 5 children living in poverty, I think there is a clear principle that is true for all of us in both cases. The first thing that jumps out to me about this passage is the incredibly harsh language Jesus uses to describe not only his protective spirit of little ones, but also how he feels about those who commit atrocities against them. Large millstone. Hung around their neck. Drowned in the depths of the sea. Cut off the hand that causes them to stumble. Gouge out the eyes. He doesn’t talk like this about anything or anyone else. Wouldn’t you be asking that? Even if they could get past the fact that the Prince of Peace just said it would be better for a perpetrator to be drowned in an ocean than harm a child… what did that have to do with them? None of them was on probation for having harmed a child. None of them was guilty of the offense that Jesus was pronouncing judgement on. So why is he telling them? What did he want from them? I believe that this interaction between Jesus and the disciples was for a singular purpose: Jesus was inviting his closest circle to have their hearts be broken by the things that break the heart of God. 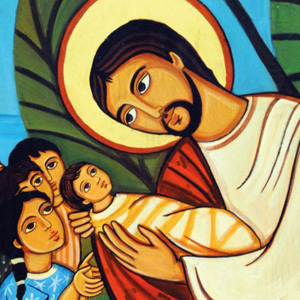 Injustice, oppression, harming the innocent and vulnerable – these were the things that broke the heart of God, and by proxy, broke the heart of Jesus. If that’s the case, then this text is incredibly relevant to each one of us. When we hear that one out of five children in our country lives in poverty, our hearts should be broken by the things that break the heart of God. When we hear that an angry white man fired 10 shots into a car full of black teenagers for playing their music too loud, our hearts should be broken by the things that break the heart of God. There are many thoughts swirling around in my heart and head today, but I keep finding myself coming back to this simple prayer. I wish it to be as true for myself as I do for you.